Our guest house „Zum Hirsch“ ist the oldest one in Ersingen and was already mentioned in 1410, when it was listed in the sale of earl Konrad von Landau to the „Ulmer Sammlung“. Until the 17th century the guest room was used for public meetings and the village court. From 1641 to 1694 Hans Greiff, who was a landlord and a farmer, was owner oft he house. In 1958, his descendant Johannes Greiff finally puts the „Ersinger Taverne“ into family property. 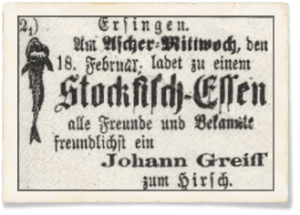 In 1874, Johannes Greiff was the first to advertise in the journal „Volksfreund Schwaben“, which was the forerunner oft he contemporary „Schwäbische Zeitung“ of Ehingen. Thereby the 140-year-old tradition of the annual „Aschermittwoch“ meal started, where especially stockfish, goat roast and snakes are served. Since over 150 years the Greiff-family leads the Hirsch, which is also simply known as the „Greiff“. Our team secures with much passion, cordiality and humor that every guest feels comfortable. Since three generations also schnapps is produced in our house. The contemporary owner Otto Georg Greiff learned the trade from his father and improved his skills in seminars at the University Hohenheim. With the participation in competitions, the quality is regularly assured. Since many years, Mr Greiff is called as an examiner for small distilleries. His schnapps and liquors regularly get awarded with gold and silver medals. With all the results oft he submitted schnapps and liquors Otto Greiff occupies the 4th place in the association of Northern Württemberg, which includes over 180 distillers.